Each year, people from all over the world visit the Christkindlmarket. The outdoor market in the Chicago Loop has become so popular and loved that any Chicagoan will tell you that they could not imagine the city without it. The Christkindlmarket is no longer just a German tradition; it has become a Chicago institution. The unique shopping experience, typical German food and drinks, as well as diverse holiday entertainment make the Christkindlmarket Chicago a preferred and popular destination. Time: Sun-Thu 11 a.m.-8 p.m.; Fri-Sat 11 a.m.-9 p.m. Since the early 1870s, Macy’s has been stunning spectators with its famed holiday window displays and celebratory events. Macy’s was the first store to feature holiday windows created for the pure fun and joy of the season and, with that, began a tradition that still lives on today. Be sure to go inside the store to see the Macy’s Christmas Tree, too! Time: Mon-Sat 10 a.m.-9 p.m.; Sun 11 a.m.-7 p.m. Location: Macy’s, 111 N. State St. In the heart of the Chicago Loop, with the city’s skyline as a backdrop, a ribbon of ice winds through a rolling landscape, providing an ice skating experience unlike any other. The skating ribbon is dramatically different from typical civic ice rinks, creating a multisensory activity that is integrated into the landscape. Skaters can experience “alpine in the city” as they lace up their ice skates and follow a path twice the length of a lap around a traditional skating rink. Complementing the ribbon are places to enjoy a cup of hot chocolate and rent skates. Time: Mon-Thu noon-8 p.m.; Fri noon-10 p.m.; Sat 10 a.m.-10 p.m.; Sun 10 a.m.-8 p.m. Location: Maggie Daley Park, 337 E. Randolph St. 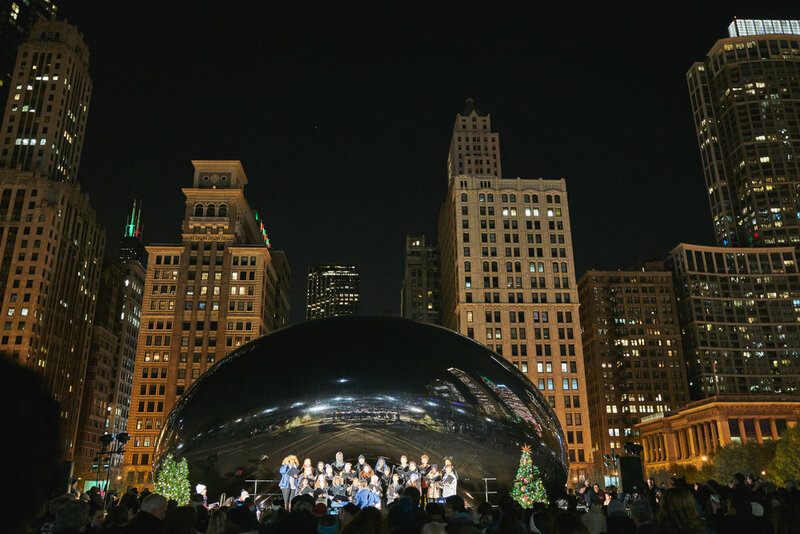 Bundle up and belt out some holiday classics as local Chicago choral groups lead hundreds of celebrants in song at this iconic work of art in Chicago’s gorgeous Millennium Park. Location: Cloud Gate (“The Bean”) in Millennium Park, 201 E. Randolph St.
Dine in the historic Berghoff restaurant amid beautiful, elaborate holiday decorations and even a couple appearances by Santa himself (Nov. 23 and 24). The Berghoff’s popularity over the last century is a tribute to its consistent dedication to quality, warmth and whimsy. Gluten-free options and lighter German-inspired fare, along with longstanding favorites like creamed spinach and Bavarian pretzels keep customers old and new coming in. Paired with the old-world charm of the landmark building, filled with Chicago mementos and artifacts, The Berghoff has something to delight everyone who visits. Location: The Berghoff Restaurant, 17 W. Adams St.
Nestled in the Wabash entrance of Chicago's iconic Palmer House Hilton Hotel, Sugar Bliss Patisserie is an independent, woman-owned bakery that serves up a full line of both classic and contemporary baked goods inside a chic and modern European-inspired patisserie setting including: morning pastries, made to order crepes, cupcakes, cake pops, French macarons, tarts, cookies, brownies, as well as a full line of espresso drinks. This spot has a beautiful seating area for customers to enjoy their coffee and sweets, and it also offers afternoon tea and sweets each day. Time: Mon-Wed 8 a.m.-7 p.m.; Thu-Fri 8 a.m.-8 p.m.; Sat 9 a.m.-8 p.m.; Sun 10 a.m.-5 p.m. Location: 122 S. Wabash Ave.